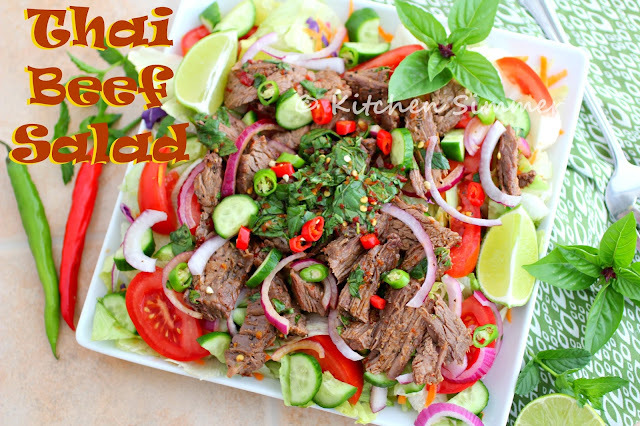 Thai Beef and Basil Salad is a refreshing and spicy salad that can be eaten as a first course or as a meal. I am still experimenting in the kitchen after dining out at a local Thai restaurant. We ordered two salads at the restaurant and I have already recreated the Thai Larb Gai Salad and my family was thrilled about how close I got to the restaurant's version. My son actually said that he preferred my version. ** Pat myself on the back! This time I decided to tackle the beef salad that we had at the restaurant. They did not have Thai basil leaves in their salad, but since I grow it in my herb garden and I adore Thai basil... I decided to add it to my salad. The restaurant also added ground roasted rice into their salad, but my son really disliked the texture that it gave so I did not add it to either of my salads. Again, he preferred my version of this salad. **Yes, I'm doing a little happy dance! This salad does take some time to marinate, then bake in the oven as far is the beef is concerned. We like our beef well done so I cooked it until there was no pink. Please adjust to your desired level of "doneness". 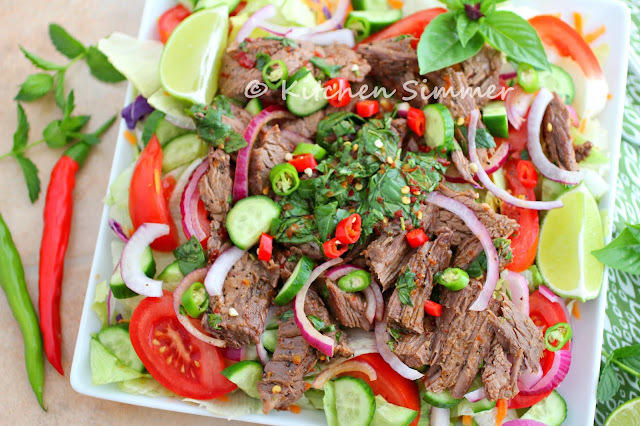 Other than the beef part of the recipe, the marinade, dressing and salad take no time at all to pull together. The dressing was amazing and so easy to put together. I love how fresh and bright this dressing is with the lime juice, basil and mint. Of course I love things spicy so I added some sambal oelek to spice things up. My husband was amazed how well I made these two Thai salad recipes at home. He said if I keep this up, we can forgo the trips to Thai restaurants in the future. Maybe, but not until I have tried all the dishes at the restaurant first. Ha! Ha! Place Beef in plastic bag. Mix marinade and pour into bag with beef. Massage beef well with marinade. Then all it to sit on the counter for 30 minutes before baking. Note: This is a quick marinade because the lime will start to cook the raw beef. Leave only on the counter for 30 minutes to bring beef up to room temperature...not longer. 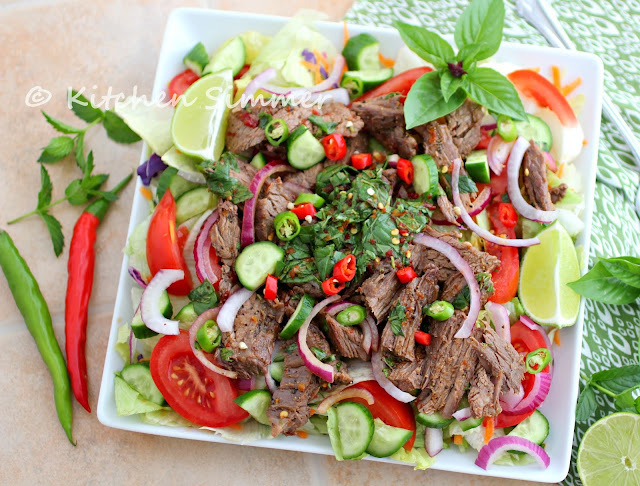 Place marinated beef on a large baking sheet. Generously sprinkle black pepper all over the beef. Bake in a 375 degree oven for 30 minutes or done to your desired taste. Clean Thai Basil leaves and mint by washing and removing stems. Tear up and place with all other dressing ingredients in a bowl. Taste and adjust as desired. Add more fish sauce for salt, brown sugar for sweetness or lime for brightness and freshness. Set aside until needed. When beef is done allow it to sit for 30 minutes before slicing. Place sliced beef in a bowl and pour 1/3 of the dressing over the beef and allow it to soak up the flavors for 10-15 minutes. In a large bowl or platter layer the lettuce, then cabbage, carrot, cucumbers, tomatoes, onions and chilies (in that order). Pour remaining dressing all over the salad. Then top with dressed beef. Serve immediately and eat at room temperature.